If you’ve ever had Oreo Truffles–those luscious bon-bons of pulverized Oreo encased in chocolate–you’ll love my original take, which is a heck of a lot easier and prettier, too. The original Oreo Truffles always irritate me because I can never get a nice, smooth chocolate covering on the balls. You’ll see what I mean next month when I feature a different take on such truffles. Therefore, I removed the balls from the equation. This recipe has a brownie base, topped with an Oreo-cream cheese mix, then topped with a ganache. 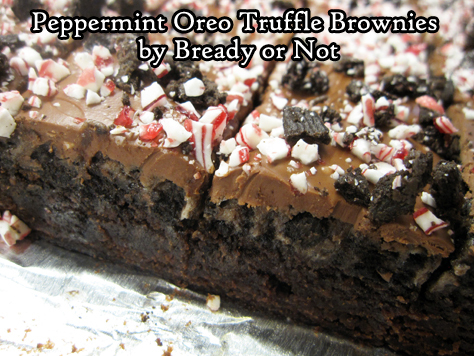 Oreo crumbs and peppermint bits give it a showy finish. No dipping balls in chocolate for an hour. No mess everywhere. This recipe is easy-peasy. 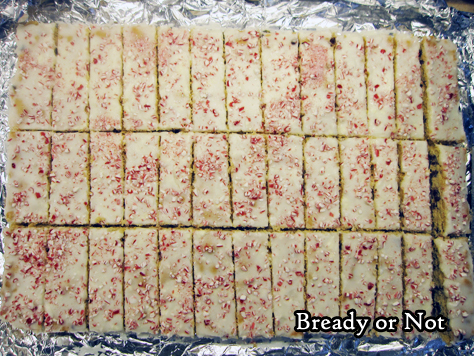 Plus, the cut-up bars will keep for as long as a week if they are sealed in the fridge. 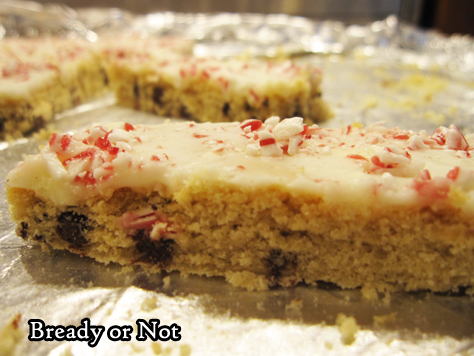 That makes them convenient to make-ahead for holiday gatherings… and lets you finish them off at your leisure afterward. You can use a number of different kinds of Oreos here, too. 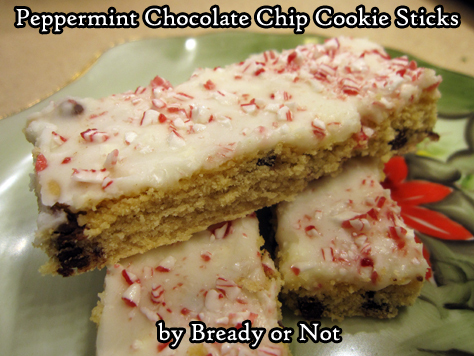 Mint Oreos are great, but regular Oreos are fine if you add some extra peppermint extract. You can use all-chocolate kinds of Oreos–even the new Thin Oreo version–but I don’t advise using Double Stuf. 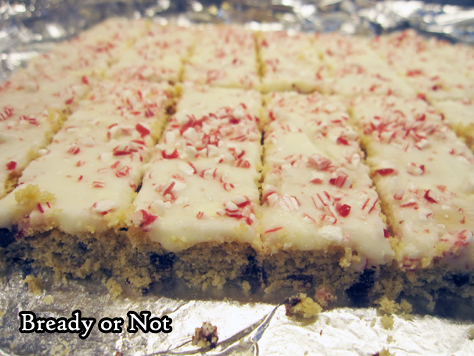 You do want a lot of cookie crumbs. 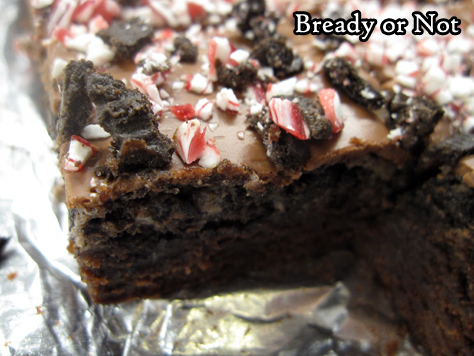 This Bready or Not original remakes traditional Oreo Truffles in a brownie bar form that’s a lot more convenient to make. *Note that original or all-chocolate Oreos or even new Thin Oreos may be used; just add another 1/2 teaspoon peppermint extract to either the Oreo layer or top chocolate layer. However, don’t use Double Stuf. You want more cookie crumbs! Preheat oven at 350-degrees. Line a 9x13 pan with aluminum foil and coat with nonstick spray or butter well. In a mixing bowl, cream together the butter and sugar. Add eggs, followed by the two extracts, salt, cocoa, and flour. Don't overbeat. Pour batter into the prepared pan. Bake for 22 to 27 minutes. Cool completely. 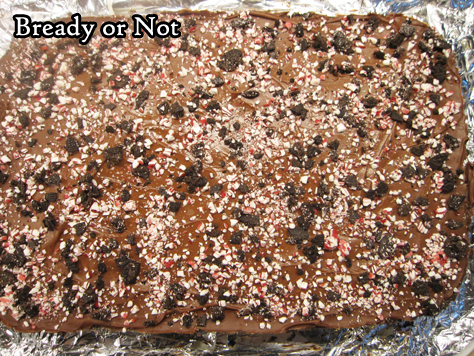 While the brownies are cooling, make the Oreo truffle layer. Crush Oreos in a food processor or by putting them in a sealed gallon bag and smashing them with a rolling pin until rendered to crumbs. Reserve 1/4 cup of Oreo crumbs for topping. Place the rest of the crumbs in a large bowl, and use a big spoon to mash the Oreos into the softened cream cheese until the color is consistently black. 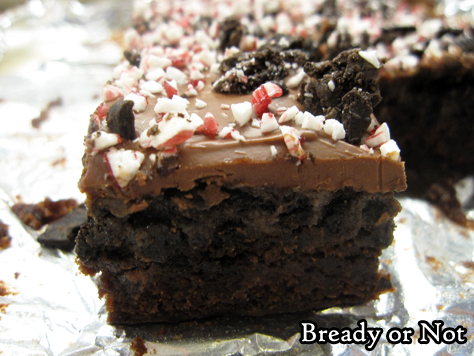 Smooth the Oreo-cream cheese mix atop the cooled brownies, using an offset spatula to get right to the edges. To finish off the truffles, melt the chocolate either on the stovetop or in the microwave, and pour it over the Oreo layer. Smooth it out evenly. 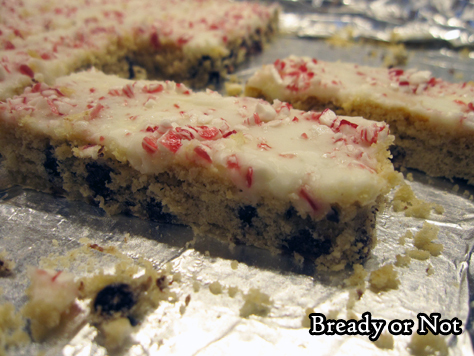 Immediately top with the reserved Oreo crumbs and peppermint bits. Refrigerate until set, about 15 to 20 minutes. If it's too soft, and it will smear when cut; too hard, and it will crack. 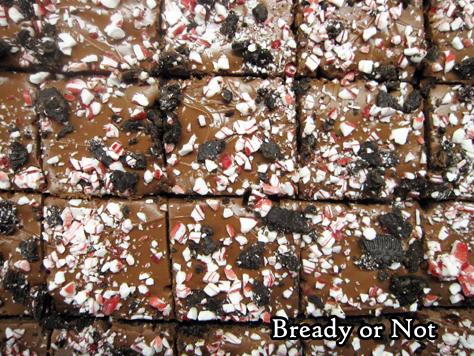 Use the foil to lift the brownies onto a cutting board, then slice into bars. Store in a sealed container in the fridge, with waxed paper between the stacked layers. Keeps for at least a week. 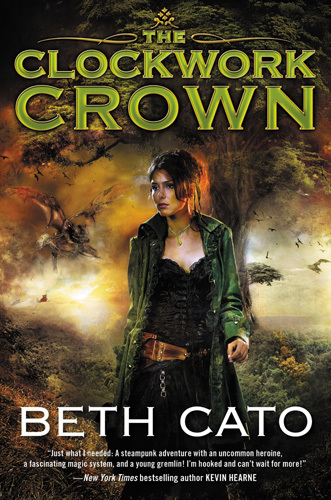 The end of the year is nigh, which means it’s time for awards buzz to build up within genre fiction. I have three works in three categories that I wish to bring to readers’ attention. 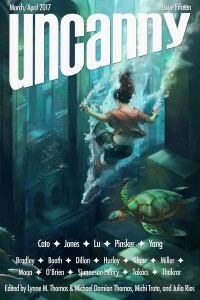 SHORT STORY CATEGORY: “With Cardamom I’ll Bind Their Lips,” Uncanny Magazine issue 15. Available to read online; podcast version can be downloaded here. Reach out via the Contact Form to request a different format. 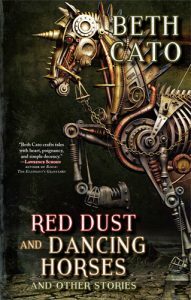 COLLECTION CATEGORY: Red Dust and Dancing Horses and Other Stories, Fairwood Press. Available in print and ebook at all major booksellers. 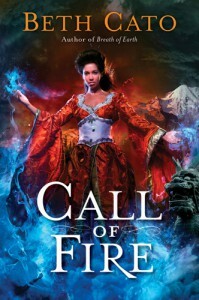 NOVEL CATEGORY: Call of Fire (#2 in Blood of Earth Trilogy, following Breath of Earth), Harper Voyager. Available in trade paperback and ebook everywhere.